THE long-running dry conditions which have affected much of eastern Australia since April 2017 have had a severe impact on water resources in the Murray–Darling Basin (MDB), according to the latest Special Climate Statement from the Bureau of Meteorology. The dry conditions have been exacerbated by high temperatures, including Australia’s hottest summer on record in 2018–19. The low rainfall and high temperature over the drought period have had significant impacts on water resources, particularly stark in the northern MDB where inflows to all catchments have been persistently well below average. On one-to-two-year timeframes to the end of March 2019, the rainfall deficiencies in the MDB are third-lowest on record behind similar length timeframes between 1901 and 1903, and between 1918 and 1920. Water storage levels in the northern Murray–Darling Basin are now lower than during the Millennium Drought. 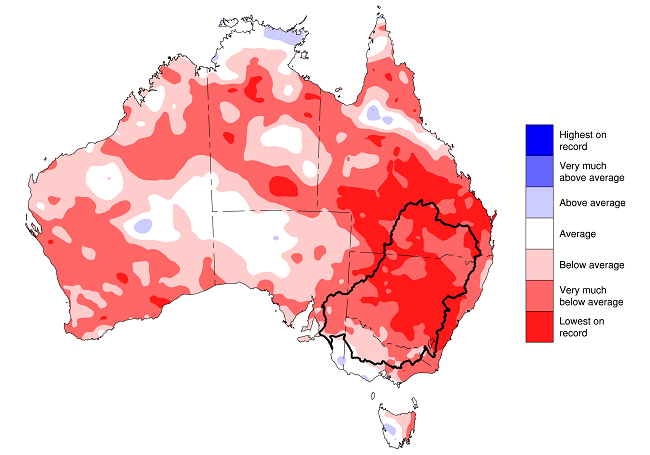 New South Wales has been the focus of the notable dry conditions. Other areas affected by rainfall deficiencies include southern inland Queensland, central and east Gippsland in Victoria, and parts of eastern South Australia. The dry conditions of the last two years follow a period of longterm rainfall deficiencies from April 2012 to April 2016, which primarily affected two regions—most of inland Queensland (and adjacent border areas of northern New South Wales), and central and western Victoria. A major rain event in northern Queensland in February 2019 resulted in extensive flooding, but largely missed regions to the south that are most severely affected by the current drought.